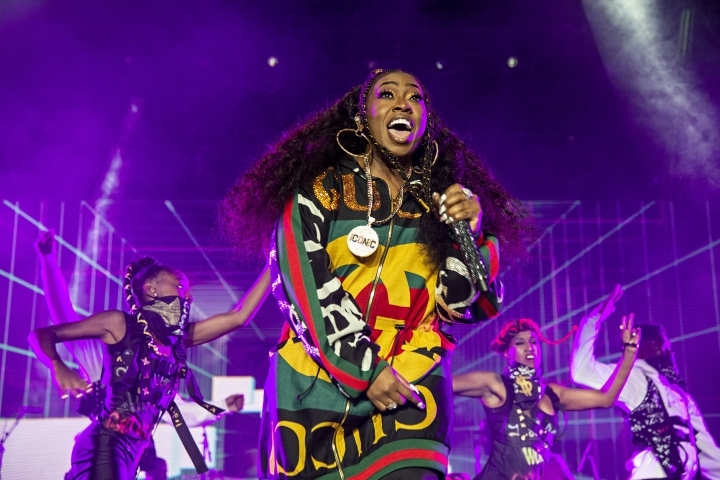 NEW YORK — Missy Elliott, one of rap's greatest voices and also a songwriter and producer who has crafted songs for Beyonce and Whitney Houston, is one of the nominees for the 2019 Songwriters Hall of Fame. Elliott is the first female rapper nominated for the prestigious prize and could also become the third rapper to enter the organization following recent inductees Jay-Z and Jermaine Dupri. The Songwriters Hall gave The Associated Press the list of nominees Wednesday, a day ahead of its official announcement. Joining Elliott as performing nominees are Mariah Carey, Chrissie Hynde, Vince Gill, Mike Love, Jimmy Cliff, Jeff Lynne, Cat Stevens, John Prine, Lloyd Price, Tommy James and the Eurythmics (Annie Lennox and Dave Stewart). Non-performing nominees are Jack Tempchin, Dean Dillon, Jerry Fuller, Tom T. Hall, Roger Nichols and Dallas Austin, who wrote hits for TLC, Madonna, Monica, Pink and Boyz II Men. Nominated non-performing songwriting duos include P.F. Sloan and Steve Barri, Russell Brown and the late Irwin Levine, musical theater writers Lynn Ahrens and Stephen Flaherty, Dean Pitchford and Michael Gore, Dan Penn and Spooner Oldham, Bobby Hart and the late Tommy Boyce. Songwriters are eligible for induction after writing hit songs for at least 20 years. Six songwriters, or songwriting groups, will be officially inducted at the Hall's 50th annual Induction & Awards Gala in New York on June 13, 2019. Eligible members can vote for three non-performing songwriters and three performing songwriters until Dec. 17. Elliott, often praised for her wild, colorful style and playful lyricism, has been one of pop music's most sought producers and songwriters, in addition to creating her own well-known hits, from "Get Ur Freak On" to "Work It" to "Lose Control." R&B singers and girl groups heavily benefited from her songwriting work in the '90s and '00s. Elliott churned out hits like "Where My Girls At," which reached No. 4 on Billboard's Hot 100 chart and Monica's "So Gone," a No. 1 R&B hit and Top 10 pop success. Though it sampled LaBelle's mid-'70s hit "Lady Maramlade," Elliott re-worked the song into a modern classic in 2001, starring Christina Aguilera, Pink, Lil Kim and Mya. It went on to win a Grammy and top the Hot 100 chart for five weeks. Elliott, who came on the music scene alongside mega-producer Timbaland, also worked on multiple songs for the late icon Aaliyah as well as Carey, Janet Jackson, Mary J. Blige, Destiny's Child, Fantasia, Jazmine Sullivan, SWV, Total, Tweet and others.